Bringing flowers into your home is a beautiful and easy way to infuse color into your decor. 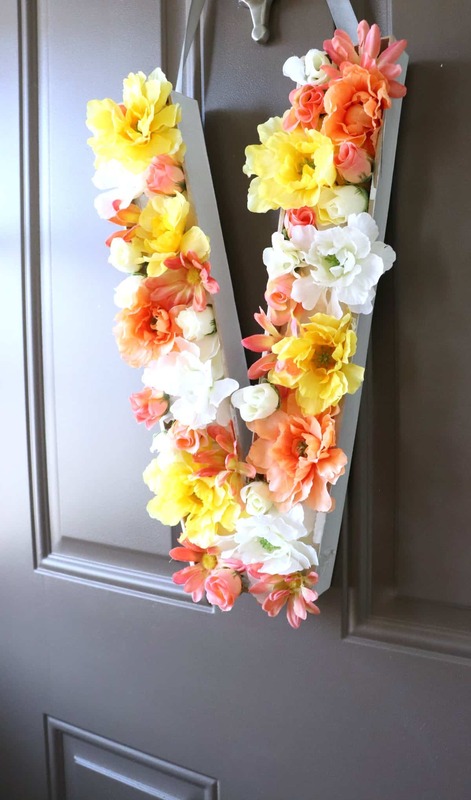 I am showing you how to make a floral monogram for Spring that looks great on a front door or as a focal point anywhere in your home. Get all the details below including a video that walks you through all the steps. My front yard is kind of a plain boring space this time of year. We have a neutral colored house and at the tail end of winter with no snow on the ground everything is just blah. I have added colorful flowers and trees in my front yard to bring color and interest to it during the Spring and Summer months, but until those bloom we are left with a lot of gray. Colorful front door decor this time of year is key to brightening up the front of my home. 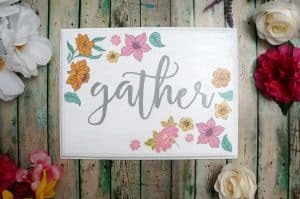 This floral monogram is large and bright and a wonderful way to welcome guests into my home. 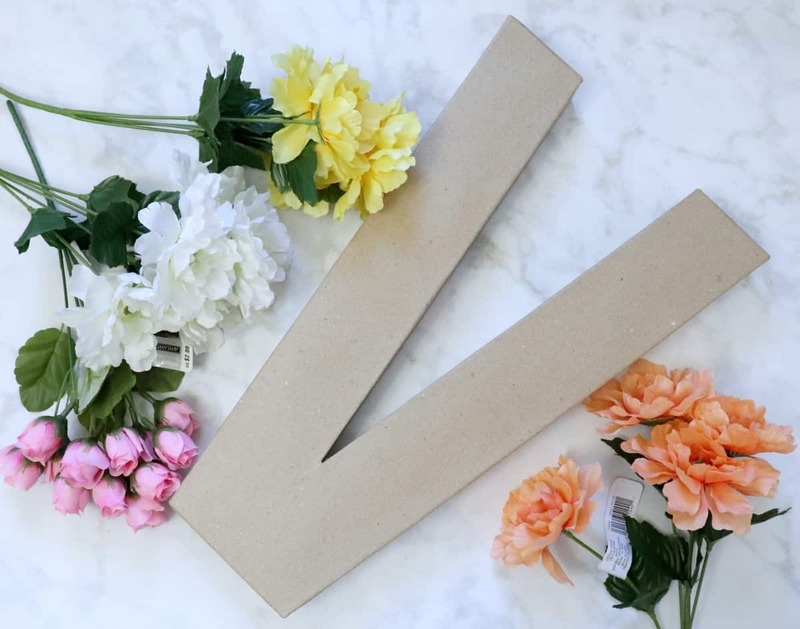 This monogram is going to be filled with flowers, so start by cutting off the top of the letter with a craft knife and taking out any supporting pieces inside. To give the letter a finished look, use a glossy white spray paint to cover the back and sides of the letter. While this is drying you can start prepping your flowers. Use a wire cutters to snip off the blooms from flower stems. I used white, coral and yellow to stand out against my gray front door. Once the paint on the letter is dry, add foam to the inside to act as a base for the flowers. I used craft foam I had left over from a project. You can use floral foam or styrofoam, you just need something that the flowers can stick to. Then you are ready to start filling in the letter. Using a hot glue gun, start adding large flowers first and fill in the spaced with smaller blooms. 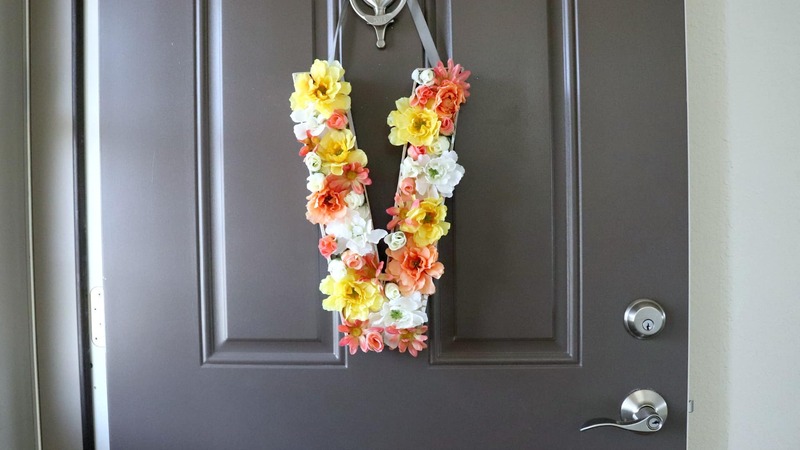 Add a ribbon to the back and hang this floral monogram from a hook on your door. I love the coral and white in this floral monogram and it adds a beautiful pop of color to my gray and plain front yard.